The picture Powell mentioned in his Meet the Press appearance that partially moved him to publicly endorse Obama. The story behind it was of a boy who was 14 when 9/11 happened and stayed determined to serve and fight for his country by the time he was of legal age to join the military. He won a number of decorations for his service before being killed in action in Iraq. Powell had become disgusted that an entire political movement in this country would tell someone like Kareem Rashad Sultan Khan that he could serve and die for his country, but that anyone of his faith should never be allowed to even dream of becoming President of the United States. He became even more disgusted that an entire political movement would use the specter of extremist terrorism to try and cow the American public into fearing a man, Barack Obama, who was actually a Christian. There are Muslims in this county today who will fight and die to protect the same freedoms that many of us hold dear. There are critics of these Muslims and their faith who, when given the chance to serve, especially some in the media, found other things to do or ducked service all together. While I don’t believe that everyone should vote Obama because of this issue; everyone should be as disappointed or outraged as Powell must be at this point with the situation. Some of what’s been said and directed at Muslims and people of Arabic faith since 9/11 and especially in this election season is every bit as vile, ignorant and baseless as what was directed at Catholics up until only a few short decades ago and the Irish in America just some few years before that. 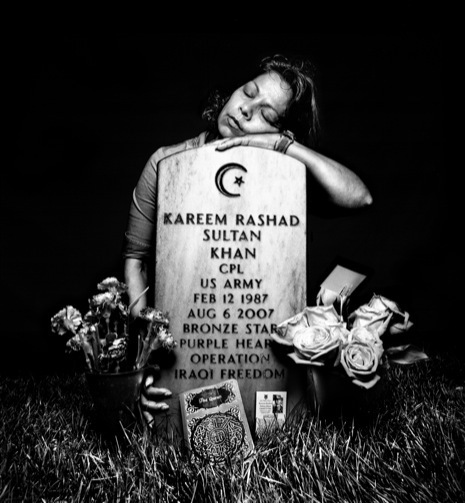 Kareem Rashad Sultan Khan went to war for this country to fight the terrorists who attacked us on 9/11 and was killed while performing that duty. He was not the only Muslim nor the only person serving who is not a follower of the Jewish or Christian faiths. It’s time that we assign the bigoted specter of “the wrong religion” to the dustbin of history along with “the wrong nationality” and “the wrong color” as should have been done before now.